Usually coffee is made in the old fashioned way of brewing it in the pot. However, if you have a stomach sensitive to the acids that are in coffee, you might find this different method quite useful. It’ll create your coffee in a way that is far less acidic and therefore a bit more gentle on your stomach. Of course it takes a little longer to create it initially, but it’s well worth the wait. It functions a little more like a tea pot than a coffee pot. At least the process itself reminds me a little more of tea, except with a much longer steeping time. No electricity is actually needed, just add the ground coffee, fill the water chamber and then allow for it to steep for 12 hours. By doing this, it creates a concentrate that can then be mixed with water or milk and served either cold or hot. 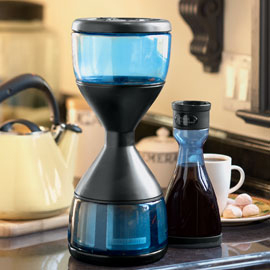 You can purchase the coffee maker for $79.95 from Solutions.